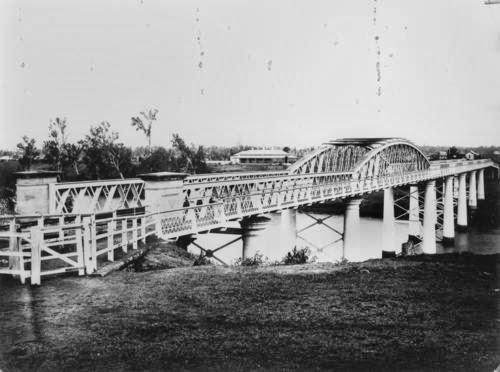 The first bridge across the Brisbane River at Indooroopilly (above) was completed in 1876 to allow the rail connection between Brisbane and Ipswich, and later the Darling Downs. It was named the Albert Bridge in honour of the Prince of Wales, and was demolished in the 1893 floods. The following two images show the huge amount of debris that caused the bridge to collapse, then the aftermath with a large section of bridge washed away. It fell to the Chief Engineer of the Railways, Mr HC Stanley, to design a new bridge, and he completed his work by mid-1893. Stanley sought to reduce the impact that swirling flood waters and debris might have on the bridge by having only one central pier instead of the several piers that supported the earlier structure. Brisbane contractors John McCormick & Sons won the tender with a price of £66,000. The bridge was scheduled to be operational in December 1894, but extra time needed to the remove bedrock for the central pier, together with a coal strike in the UK which caused a delay in the manufacture of steel, postponed that opening until August 1895. 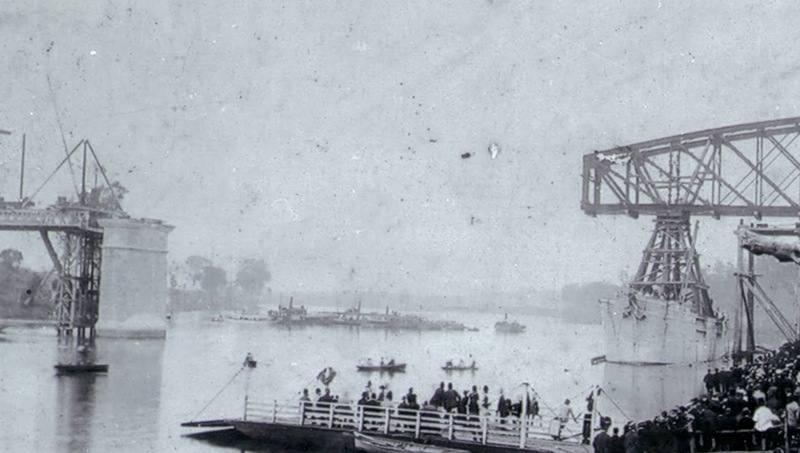 During the construction of the bridge the ferry service continued to carry passengers across the river as can be seen in the following photograph. The completed bridge was also called the Albert Bridge, and it allowed pedestrian traffic as well as the much needed trains. The ferry continued to operate alongside the bridge, carrying horses and associated vehicles, as shown in the next image from 1906. The second Albert Bridge is one of the largest truss bridges in Australia. The Walter Taylor Bridge (at the time known as the Indooroopilly Toll Bridge) for cars and pedestrians was built next to the Albert Bridge and opened in 1936. The following image shows them in tandem. 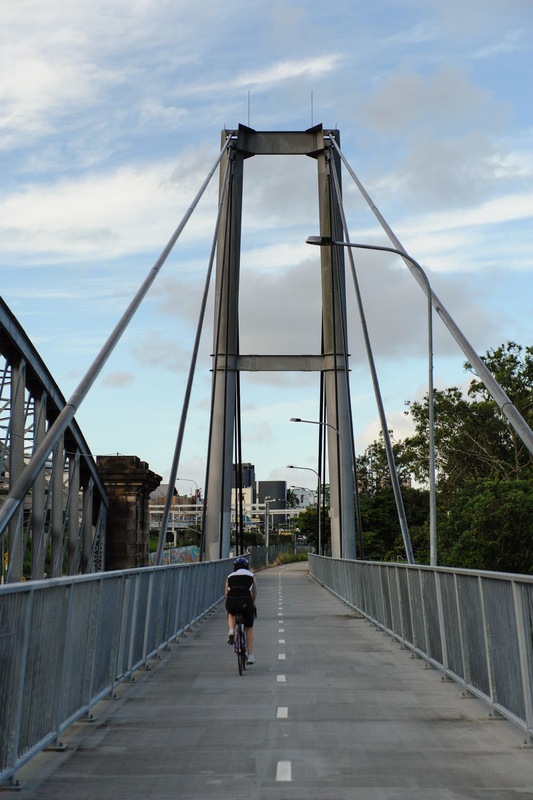 In 1957 a second railway bridge, as yet unnamed, was built between the Albert Bridge and the Walter Taylor Bridge to allow an increase in the number of rail lines between Brisbane and Ipswich. Here are a couple of photographs taken during its construction. A fourth bridge was erected at this site in 1998. Named the Jack Pesch Bridge to honour the ex-cycling champion and bike shop proprietor, this bridge is for cyclists and pedestrians only. Click here for a Google Map showing the location of the four bridges. The Walter Taylor Bridge opened on Valentines Day 1936. After nine years in the planning and construction you could say it was a labour of love ! The 1957 "middle" rail bridge is sometimes called "Finnegans", after John Finnegan who was one of the three convicts (Thomas Pamplett, Richard Parsons , and John Finnegan) that ended up in this part of the Brisbane River while looking for a way across and to head "north" back to Sydney. They were SERIOUSLY lost.! You are in my favourite period, thanks :) The late 19th century engineers wisely wanted to deal with the huge amount of debris that caused the original bridge to collapse. I can well imagine swirling waters during peak flood periods but I have no idea a] how often a flood occurred and b] what all that debris was. If I look at the Yarra, for example, the worst debris might be picnic food off the tourist boats. Our water wasn't clean for many decades, but there was no whirling debris creating structural damage. As the river swells fro rainfall it's boundaries expand, pulling in trees animals and anything else in its path. These things get caught up in each other around the pylons and the continuing force of the water will eventually be strong enough to break almost anything. We had similar incidents in the 2011 flood, although thankfully nothing as substantial as a bridge.